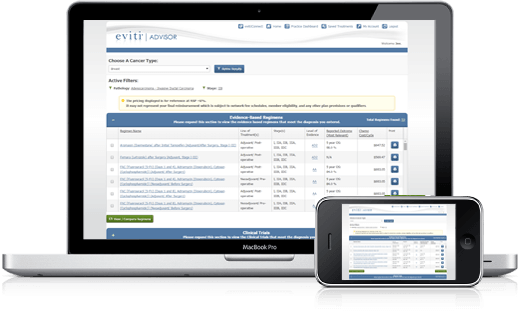 If you are a provider and do not have an eviti account, please click here to register and access our services. 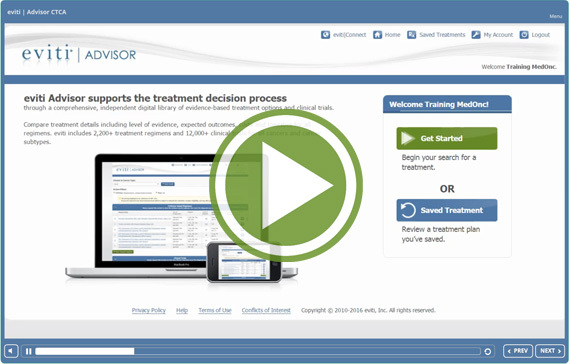 through a comprehensive, independent digital library of evidence-based treatment options and clinical trials. Compare treatment details including level of evidence, expected outcomes, costs and toxicities for all regimens. eviti includes thousands of treatment regimens and clinical trials for all cancers and cancer subtypes. We will guide you through how eviti|Advisor works, and how it can benefit you. Watch the demonstration video above to see how eviti|Advisor works. Copyright © 2010-2019 NantHealth, Inc. All rights reserved. Copyright © 2010-2016 NantHealth, Inc. All rights reserved.